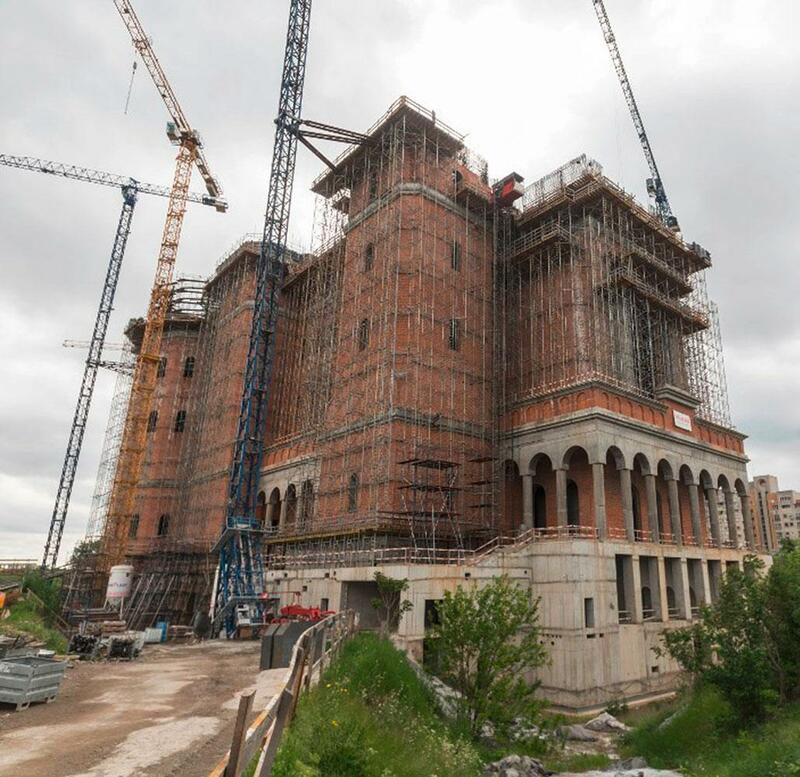 Bucharest – In the heart of Romania's capital, a new Orthodox cathedral of impressive dimensions is now under construction. Measuring 124 metres long, 70 metres wide and 120 metres high (at the base of the cross), the place of worship will accommodate up to 5,000 people, making it one of the biggest Christian Orthodox churches in the world. Construction company Strabag is relying on formwork solutions from Doka for the complex geometric structures. The idea of building the "People's Salvation Cathedral" (Romanian: Catedrala Mantuirii Neamului) was proposed by the late Patriarch Teoctist I and the foundation stone was laid by his successor, the current Patriarch Daniel I. The new cathedral will also be the future see of the patriarch of the Romanian Orthodox Church. The cathedral complex is located on Arsenalului Hill, in the immediate vicinity of the Palace of the Parliament. It will also include two multi-purpose halls each big enough to hold 1,000 persons, two pilgrims' hostels and a health centre. Construction work started in December 2010 and is scheduled for completion by the end of 2018. The bell is a significant feature of this construction project. Weighing 25 metric tons and standing 3.3 metres tall, it will be the world's biggest free-swinging bell. It was cast by the Grassmayr bell foundry in Innsbruck, Austria. The geometrically complex panel elements such as arches, domes, half-domes, volutes, rings and cylindrical walls were designed in Amstetten by the Engineering Office Eastern Europe together with Doka engineers from Bulgaria and the Ukraine and the Structural Engineering Department. The building was divided into 7 construction sections for better coordination of the construction process and deployment of the materials. Along with the geometric and technical challenges there was also the matter of a tight schedule, which required some 8000 engineering hours within a mere 10 months. Customer quoted that in all, 100,000 m³ of concrete, 3,800 metric tons of rigid reinforcement and some 38,000 metric tons of flexible reinforcement will go into the structure. The systems used include the Doka load-bearing tower systems Staxo 100 and Staxo 40, plus Large-area formwork Top 50, Framed formwork Framax Xlife and Timber-beam floor formwork Dokaflex. 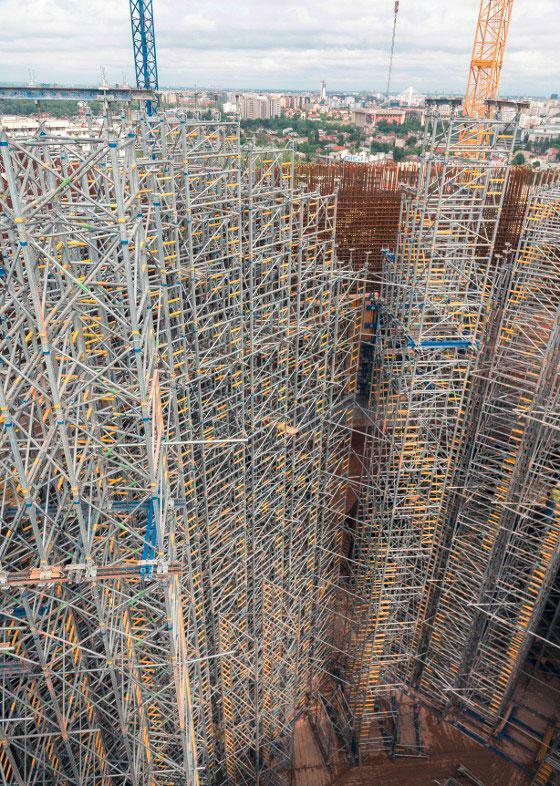 Load-bearing towers Staxo 100 and Large-area formwork Top 50 are used both inside (up to a height of 27 metres) and outside (up to a height of 124 metres) on this cathedral build. To permit best possible use of the special panel elements high above ground level inside the cathedral, as of a height of 27 metres the Staxo 100 towers are erected on top of a steel platform. The Staxo 100 load-bearing tower frames are steel, eminently suitable for high clearances and high loads. For irregular floor plans, moreover, height can be steplessly precision-adjusted to the millimetre. The towers also help speed up progress overall on the build, because vertical stacking is easy and assembly is a no-tools operation. Doka also compellingly demonstrates the high level of safety designed into the systems. 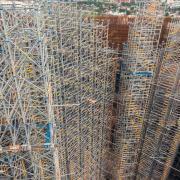 The stair towers enable the site-crew members to reach their workspaces quickly and in safety. First choice for the walls and columns are the lightweight and easily handled Framed formwork Frami Xlife with strong, hot-dip galvanised steel frames and the Framax Xlife steel framed formwork, which is crane-lifted for forming large areas. 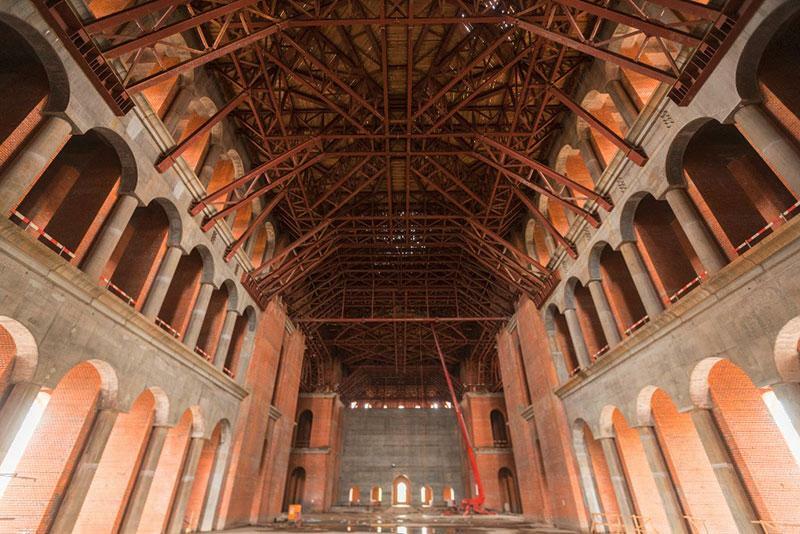 Thank you for your interest - Romania's new national cathedral. 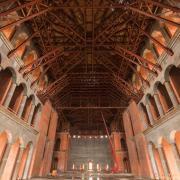 Thank you very much for your interest - Romania's new national cathedral.